Long gone are the days when you could pickup a cheap ex-racer because nobody wanted a car that had been ridden hard and put away wet. Today, the vintage racer market is carefully curated by scores of nostalgia seeking baby boomers with liquid pensions and finding a cheap car with a proven pedigree is extremely rare. There are certain unexplainable market forces in the world associated with used cars, one is that value of a VW Bus is inversely proportional to the amount of space not occupied by windows and if you could build a Bus out of nothing but window glass, you would find it guarded by Leprechauns and growing rainbows. Another strange market force is the racing pedigree associated with...well...anything that raced. A busted old Volvo 1800S in pieces is worth a few grand, but stick some racing stickers on the side along with vintage photos and the next thing you know money rains down from the sky and Ed McMahon has risen from his grave to deliver a giant check. Today's feature is a down in the dumps classic with an interesting pedigree. 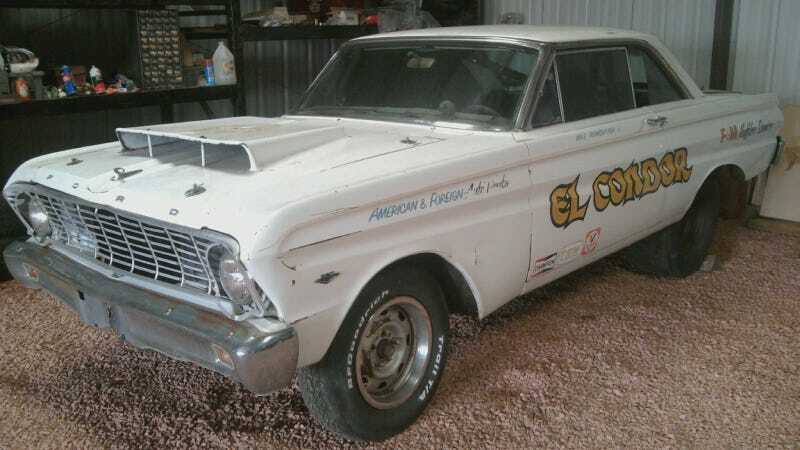 Find this 1965 Ford Falcon El Condor drag car offered for $5995 in Rosamond, CA via craigslist. No matter how much we stomp our feet and swear that history and pedigree are not important...well..they are. You could be married to the sweetest, smartest and most beautiful lady in the world, but if you knew she had been with the entire roster of the Humboldt State Lumberjacks, it would keep you up at night...and rightly so because Humboldt State is not even a division I team and that is just embarrassing. The point is...pedigree is important, even to stuck-in-the-mud cheap-asses like the authors on DT. A car driven by a family in Ohio is just not worth as much as a car that terrorized the now defunct 1/4 mile strip in Poway, CA— immaterial of condition. Secretariat's horseshoe is worth more than a barn full of old heffers...it is just a fact...but that provenance needs to be proven. The seller in this ad simply says this was a former drag car built in the 1970s and the engine/trans is not installed...hey there it is in a pile resting in some dirt. At least it hasn't been covered in chicken poop. A quick interweb search using a sophisticated NSA derived searching algorithm (aka google) located the previous sale on the jalopyjournal.com forums. The circa 2011 owner, gtbpappy on jalopyjournal.com forums was looking for information on the El Condor before he sold it, and some of the forum regulars located the original painter, a guy named Roy, who remembers painting the car back in the mid 1970s and says it raced in the b/fx class at Orange County Raceway back in the day. It gets better...the original owner/builder/racer Mike Rumbaugh makes a post on the forum and says he will provide pics on page 31. The mentioned vintage racing pics never show up in the forum posts, but there are three people on the forum that an interested party could contact to get a copy of the pics or get in contact with Mr Rumbaugh. No reason to beat around the bush, this thing is is pretty wretched shape and drag cars were never pampered to begin with...but...its not like you've got anything with a vintage racing history that looks mostly complete, even remotely near in this price range. You'll need to spend the better part of a years worth of weekends putting this thing back together and untold thousands in replacement parts...but...you don't need to touch the paint and Falcon parts are a mouse click away from dozens of parts suppliers. Originally posted as 5k: El Condor Has Landed: 1965 Ford Falcon Vintage Drag Racer on Daily Turismo. Image credits; gtbpappy on jalopyjournal.com and craigslist.